Clean and cozy vacation rental homes from Roxbury to Margaretville and from Mt. Tremper to Andes. Choose from mountainside log homes, classic Victorians in a sleepy village, a warm ski chalet, a traditional farmhouse with modern flair, and more. 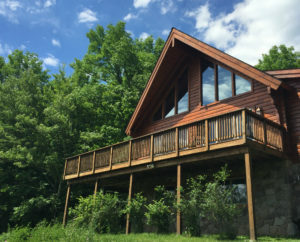 You’ll find homes with hot tubs, mountain views, fireplaces, wood stoves, did we mention mountain views, rivers and ponds, and lots of country charm! 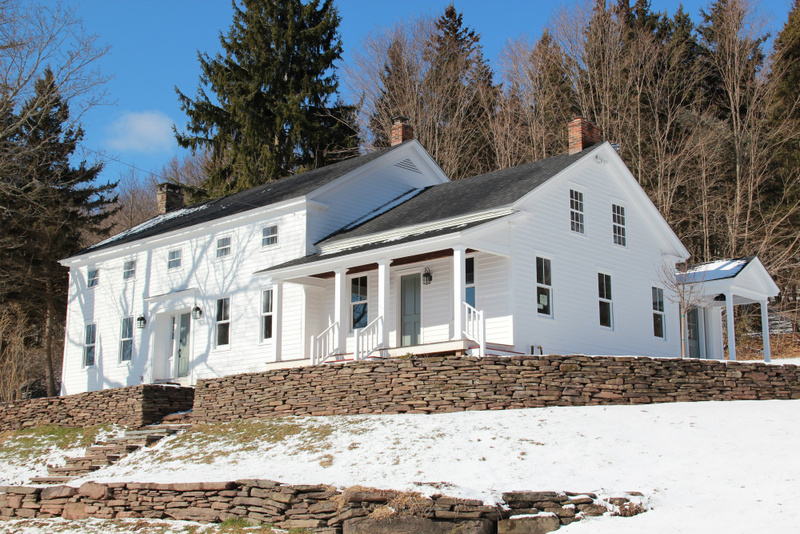 Exquisitely restored 1853 farmhouse, 5 bedrooms, 3 baths, on 50 acres of hillside with stunning views over valley and Plattekill slopes. Perfect for weddings and family groups. Fully furnished with antiques, vintage charm, and modern luxuries. Please see website for full info and photos, but for better pricing DO NOT BOOK THROUGH WEBSITE. Contact owner directly by email or phone shown above. The Manor sleeps 12 and you can walk to restaurants and shops. This home brings you back in time, featuring an historic kitchen, sleeper porch, wide plank floors, original doors and woodwork. We have combined style, convenience, and history together to create the perfect atmosphere for your vacation stay. Secluded contemporary home just outside Roxbury town. Stylishly decorated and suitable for up to 9 people. Hot tub on the deck for relaxation year round! 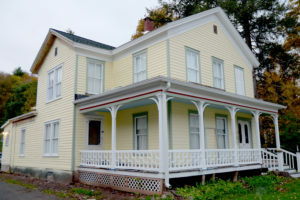 Completely renovated and impeccably furnished 5 bedroom/3 bath historic home: cook’s kitchen great room with wood burning stove; living room with wood burning stove; DirecTV; high speed satellite internet. Extremely private, unsurpassed views, up to 10 guests. No smoking, no pets. Located adjacent to the Breezy Hill Inn, this charming 5 bedroom farmhouse is minutes from skiing, hiking, antiquing and the Catskill Park. Fully furnished and suitable for up to 10, Breezy Hill Farmhouse offers a sitting room as well as living room with large flat screen TV with cable and a wood burning stove with open grate, fully equipped kitchen, open concept dining area, mudroom, and two full bathrooms. Entire home/apt in Hobart, United States. Cozy Two bedroom, one and a half bath in-law apartment nestled beside an Antique Shop (Second Wind) in the village of Hobart. Beautiful views and peaceful surroundings. 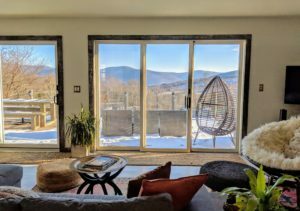 Enjoy our cool, mid century mountain digs! 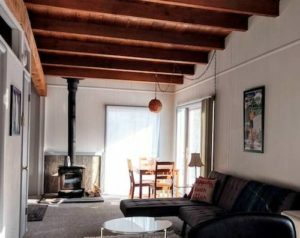 Ideal for parties of 2, the Groovy Chalet is here to meet your ski-lodging needs in nearby Margaretville. 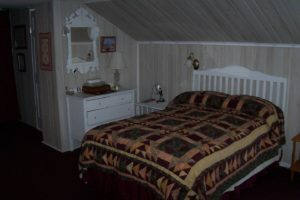 Spacious, cozy, 1 queen bed with kitchenette. Unwind by the wood burning stove while refueling for skiing and snowboarding fun. Go big from our home! To book click link above. 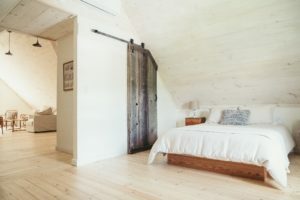 Field & Stone is a modern farm stay offering accommodations for 20+ in two recently renovated Victorian farmhouses that blend original detail alongside a mix of contemporary and antique furnishings. The houses are available for rent individually or as a package. Please inquire about indoor/outdoor event space for intimate gatherings. This 5 bedroom farmhouse has 3 full baths, 2 with jacuzzi tubs, formal dining room, living room with fireplace and pull-out queen-sleeper sofa bed. Private setting on 1/4 mile driveway. 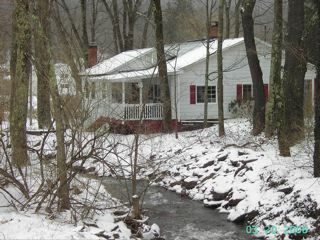 Near hiking trails with a trout stream on the property. 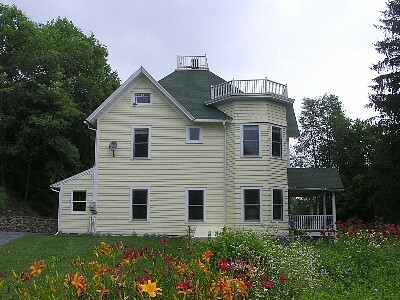 House has a large deck on the back overlooking the pond and a horse pasture. Perfect country getaway for a family or small group. Rates: $154/night for the entire house!